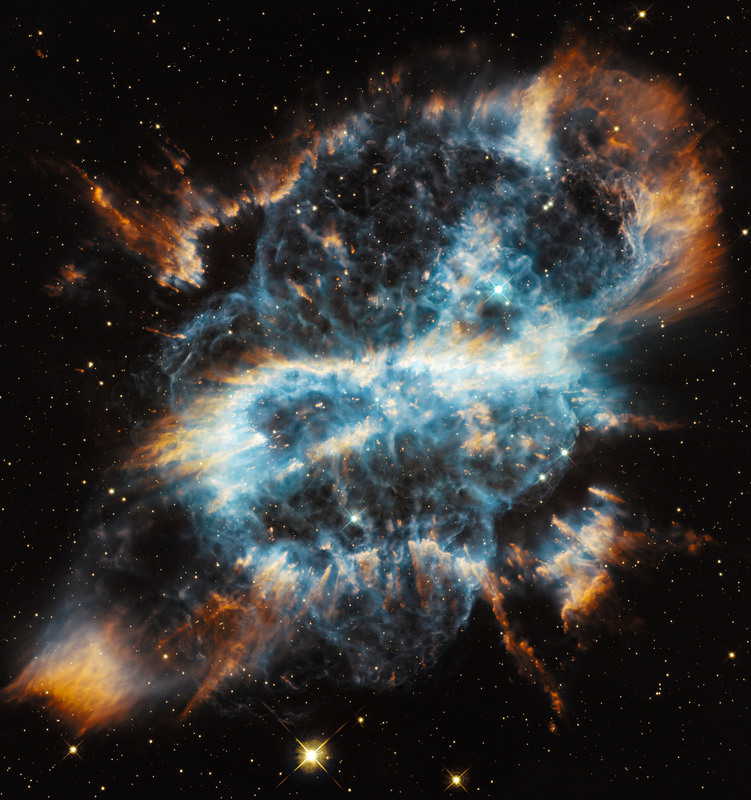 A newly released image from the Hubble Space Telescope shows the planetary nebula NGC 5189, which is located several thousand light-years away in the southern constellation Musca. The NASA/ESA Hubble Space Telescope celebrates the holiday season with a striking image of the planetary nebula NGC 5189. The intricate structure of the stellar eruption looks like a giant and brightly colored ribbon in space. Planetary nebulae represent a final brief stage in the life of a star like the Sun. While consuming the last of the fuel in its core, the star expels a large portion of its outer regions, which then heats up and glows brightly, showing intricate structures that scientists are still trying to fully understand. 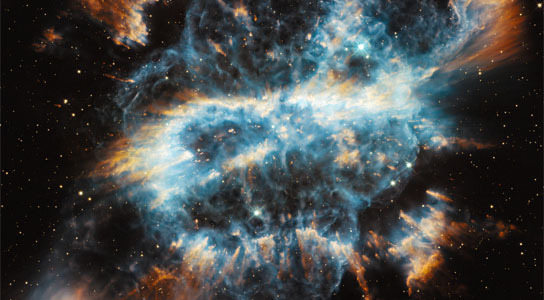 The structure visible within NGC 5189 is particularly dramatic, and Hubble’s image of the nebula is by far the most detailed yet made of this object . Hubble has been a key tool for studying planetary nebulae for years, and many of its images have become famous. As well as being highly attractive, planetary nebulae tell us about the ultimate fate of the Sun, which will form such a nebula when it runs out of fuel in a little over five billion years. These nebulae were named by astronomers studying them through early telescopes with little magnification and optics that were far from sharp. The brightly colored nebulae are often roughly spherical, and many appear green or blue like Uranus and Neptune, so their appearance evoked that of gas giant planets like those in the outer Solar System. Many of them do indeed look somewhat planet-like, but NGC 5189 certainly does not: the nebula forms a dramatic reverse S-shape. Looking at the detail of Hubble’s image, possible thanks to Hubble’s very high resolution, the nebula shows a series of dense knots in the clouds of gas. The gas and radiation flowing out from the dying star carves out shapes in the clouds, forming glowing bow-wave-like patterns towards the center of the nebula. The knots in NGC 5189 are a reminder of just how vast the planetary nebula is. They might look like mere details in this image, but each and every one is a similar size to the entire Solar System. The star at the center of the nebula, a dense white dwarf, is far too small to see as anything other than a point of light, even though it is roughly the size of the Earth. The overall shape of NGC 5189 can counterintuitively tell us about what is happening on very small scales around the tiny central star. NGC 5189’s shape is reminiscent of a lawn sprinkler, with matter being expelled from the star, which is wobbling as it rotates. Similar structures have been seen before, especially in planetary nebulae with binary stars at their centers. This is also a likely explanation for the structure of NGC 5189, though to date, only one star has been found at the nebula’s center. Previously, the best images of NGC 5189 came from the Gemini Observatory and the European Southern Observatory’s New Technology Telescope. Hubble’s surpasses both in clarity and sharpness. 4 Comments on "Hubble Views Planetary Nebula NGC 5189"
This one was found just off a small green looking moon of a gas giant dubbed Endor. A party could be heard in radio wavelengths. i am a galactic germ. Which means i dont miss a shooting star. this image of my imaginary home, exploded my mind. my new wallpaper!!!!! i chaned it to the planetary nebula from the the pillars of creation.